With over ten million people living in this sprawling metropolis, Bangkok Public Transport is an essential part of city life. For most first-time visitors, the huge public transport system can be overwhelming, so here’s a guide to how it works. In general, traffic in Bangkok is absolute chaos, especially compared to Western cities and you might feel like the Thai roads have no rules. With 24,000 annual deaths, Thailand has the second highest road death rate in the world, according to the World Health Organisation, so we recommend using public transport rather than trying to drive yourself. Bangkok generally has an amazing public transport system that’s comfortable and safe but there are some exceptions, which we’ll discuss later in this article. Normal rush hours in Bangkok fall between 07:00 and 09:00 in the morning and 16:30 and 20:00 in the evening but the roads can be busy at any time of day. Getting stuck in traffic at places like Sukhumvit Road is something you want to absolutely avoid, as you can easily end up stationary for two hours. We’ve divided this list of Bangkok Public Transport into four different groups: travel by railway, road, boat and travel to and from airports. We’ve added some non-public transport to this list as well, to give you an overview of all the available options. Together with the MRT, the BTS is the all-time favorite form of public transport for any Bangkokian, as it is the fastest way to travel in the city. The BTS, which transports over 650,000 people a day, is an elevated rapid transit system, also known as the Skytrain. This modern train system is equipped with superb air conditioning for comfort. Bangkok has two different BTS lines, Sukhumvit Line and Silom Line, that cover the most important districts of Bangkok. At Siam BTS Station, travelers can switch between Sukhumvit and Silom Line and connect to the MRT System at Asok, Mo Chit and Silom BTS Stations. The BTS Lines operate between 06:30 and 00:00. In order to access the BTS Lines, you need to buy a Rabbit Skytrain Card at the ticket booth or buy a single card at the ticket machines. If you’re planning to use BTS multiple times a day, it’s best to get an unlimited daily card for 120 THB. In 2018, the Sukhumvit Line extended all the way to Samut Prakan and further extensions are planned for the future, including to Don Mueang Airport. Travelers who need to go to Suvarnabhumi International Airport can use the Airport Rail Link that starts at Phaya Thai BTS Station. Fortravelers, the BTS is an amazing form of Bangkok Public Transport that allows you to travel in comfort and cuts out road traffic. It’s a good idea to book a hotel that’s located close to a BTS Station. Another all-time favorite Bangkok Public Transport is the MRT. Like the BTS, this metro system has two different lines: the Blue Line and the Purple Line. At Sukhumvit, Chatuchak Park and Silom Station, travelers can switch between lines and MRT and BTS systems. During rush hour, these stations get extremely busy, but using the BTS and the MRT is still a great alternative to being stuck in a traffic jam. When you travel on the MRT, you have to get either a single-journey token or an MRT Pass. Like the BTS, travelers can also get a day pass for 120 THB. As the railway systems are run by different companies, it’s not possible to use an MRT day pass for a BTS ride. The MRT Lines are available between 06:00 and 00:00. The train system isn’t ideal for getting around Bangkok, but it’s a great way to travel to different parts of Thailand. For many travelers, taking the train to the north or south of the country is a cheap, comfortable and safe option. The trains nowadays are modern and equipped with all sorts of features such as air conditioning and power sockets. Night trains, such as the train to Laos, have beds with freshly washed sheets. Each train is divided into three different classes, with First Class being the most luxurious. Popular train routes, such as the night train for the Full Moon Party or the train to Laos, quickly sell out, so get tickets at least 24 hours before departure at the ticket booth at Hua Lamphong Station. Hua Lamphong Station is Bangkok’s central hub, accessible from the Metro System. The most convenient option is to get your train tickets from the Ticket Office for Foreigners (06:00 - 20:00). Always bring your passport with you when buying train tickets, as they’ll be linked to your name. The following link contains the most recent train timetables. - Train to Chiang Mai. This train will also take you to Ayutthaya. - Train to Nong Khai. After arriving, you will take another train for 20 minutes to Vientiane, Laos. - Train to Hua Hin. - Train to Surat Thani. This is the train to the Southern parts of Thailand and takes many of its travelers to the islands and the Full Moon Party. The train to Kanchanaburi can only be accessed from a different train station named Thonburi Train Station. As the railway systems in Bangkok are limited, taxi is another popular way of getting from point A to B. You can hail any taxi when the red light (sometimes green) in front of their window screen is turned on. Waiting for a taxi, with the typical Yellow-Green colours or the complete Pink Taxis. - Always ask the driver to use the meter. If they refuse, just step out the car and look for another taxi. The starting fee on the taxi meter should be 35 THB. - When it rains, it’s extremely difficult to hail a taxi. Drivers tend to increase the price or will refuse to use the meter. - Around nightlife areas, it’s difficult to find a metered taxi. Walk away from these areas and it’ll be much easier to find a driver who will use the meter. - Avoid using taxis in rush hours, check if it’s possible to use the MRT or BTS instead. - Use Google Maps or maps.me to make sure the taxi driver is not taking a detour. - If you use the highway, you’ll have to pay the toll yourself at the toll gate. The taxi driver will always ask you if you want to take the highway or not. - Taxis can be much cheaper than the BTS if you are traveling in a group of three or four people. Taxis can be a great way to get around and are much safer than using a tuk tuk or motorbike. Taxis also typically have air conditioning, leather seats and seatbelts which make for a much more comfortable ride. On the first floor Suvarnabhumi Airport, you’ll find the taxi rank. To take a taxi from there, you need to get a ticket at the office inside the airport, they will direct you to the parking lot and your taxi. By law, the taxi driver charges an extra 50 THB fee on top of the total cost of the journey. Most taxi drivers tend to take the highway, which means you also have to pay extra toll costs. Overall, it usually costs up to 400 THB to travel from the airport to central Bangkok. Since there’s no Skytrain at Don Mueang Airport yet, you can only take a bus or a taxi so as you can imagine, it gets extremely busy. On the first level of Don Mueang, you’ll find the same taxi ticket system as at Suvarnabhumi. To avoid the queues, it’s possible to get a taxi from the second level where people are being dropped off. There are no extra fees at Don Mueang, but there are tollways before entering the city. It will cost you around 150 THB to get to Mo Chit BTS Station, including the toll fee. 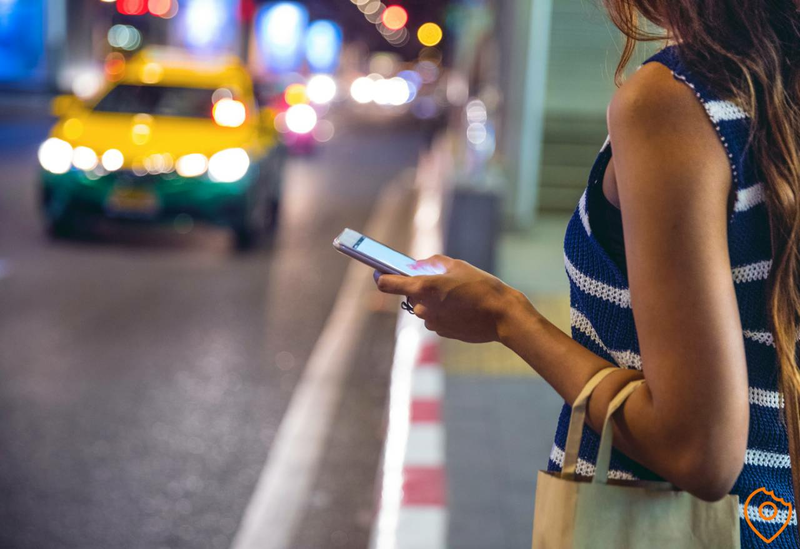 Grab is available throughout Southeast Asia and the service allows you to order a personal taxi for a slightly better price. However, since taxis are already pretty cheap, Grab is only better for long distance journeys. I’ve used it once or twice in the past two years and it cost slightly less than a taxi but I had to wait a long time before the driver showed up. I personally prefer a normal taxi and barely have any difficulties with drivers, except at touristy spots and nightlife areas. As iconic as they are, I would not recommend using a tuk-tuk. Not only are these vehicles uncomfortable and unsafe, but the level of pollution you’ll inhale when driving around the city in one is insane. Besides, tuk-tuk drivers are infamous for their scams and often charge ridiculous prices for short trips. You always have to negotiate, which makes you feel like you’re being ripped off. Taxis are much safer, cheaper and more comfortable. Everywhere you look in Bangkok, you'll see motorbikes in orange vests, taking mostly Thai on short trips around the city for 20-30 THB. I cannot stress this enough, but at all times avoid this type of transport as it is the most dangerous way of transport in Bangkok. As said, with 24.000 annual deaths by road accidents, Thailand has the second highest road deaths in the world (World Health Organisation) and 73 per cent of fatalities are riders om motorbikes. And if you do survive such a crazy short ride without a helmet, the amount of fumes you inhale will shorten your life with a least a couple of days. Minivans are a popular form of transport for long-distance trips to, for example, Ayutthaya. Each minivan can accommodate up to eight passengers and take you to various popular destinations in and around Bangkok. Since you split the cost of the journey between all the passengers, this is also a relatively cheap form of public transport in Bangkok. You’ll find these comfortable vans with air conditioning and sometimes LCD screens throughout the country. In Bangkok, the most common areas to find these vans are at Suvarnabhumi and Don Muang airports, the Victory Monument, Mo Chit Bus Station (also known as Mo Chit 2) and Ekkamai bus terminal. While minivans are a popular form of transport, you need to keep in mind that they’re often involved in accidents, as drivers get paid per ride so many drive recklessly to fit in more journeys. I strongly advise taking the train instead if possible. For most travelers, the public buses in Bangkok are not a popular form of transport because of the research required to work out bus lines and timetables, which aren’t normally available in English. The buses aren’t the most comfortable form of transport either and are frequently old and rundown. In other words, we don’t recommend you take a public bus to get around Bangkok. If you still want to try out one of these old city buses, this website gives you the route listings. Long-distance night buses, however, are a great form of transport, especially if you’re on a budget. These buses are cheap but comfortable and relatively safe. Why relatively? The buses are notorious for robberies and many tourists have reported that their backpacks have been ransacked in the luggage hold. To be safe, keep your valuables with you at all times. There is another downside to night buses, as they can be extremely slow and the longest journeys can take 20 plus hours. Tickets for these buses can be found in any city at any travel agency for destinations around Thailand. If you have a slightly higher budget, we’d still recommend the train, which is faster and more efficient. 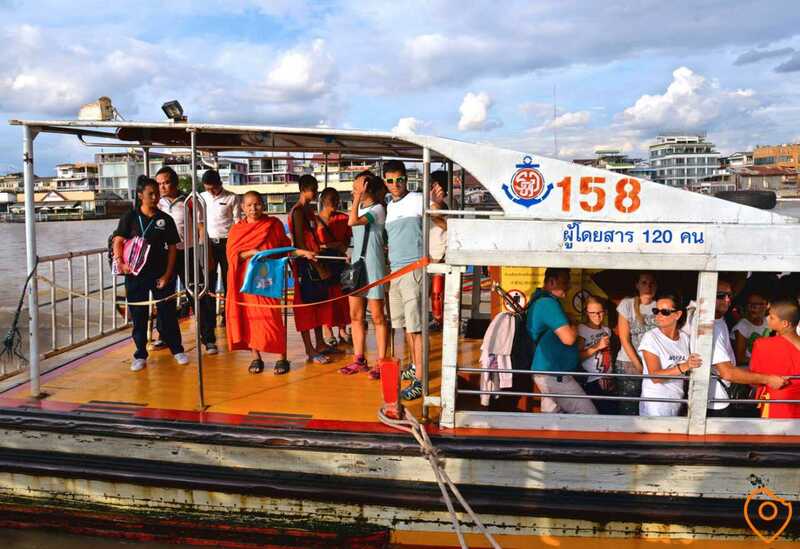 One of the top things to do in Bangkok when it comes to transport is to take a trip on the Chao Phraya River Express Boat. As the city is built around the Chao Praya River, there’s a comprehensive boat service you can use. This includes five different express lines which stop at the main piers, one of these is dedicated to tourists. The blue line is perfect for sightseeing, you can easily hop on at one the piers but most people start at Sathorn Pier located close to Saphan Taksin BTS Station. For a one-way ticket, you’ll pay 40 THB and for a day pass 150 THB, this allows you to hop on and off all day. The following link contains the most recent timetables. Simple river crossings can be found at multiple piers along the river and will cost you just four THB. Ferries are a great way to visit Wat Arun in particular. Visit this beautiful riverside temple by taking a ferry to Tha Tien Pier. If you want to explore the river by yourself, it’s possible to rent a private longtail boat at Sathorn Pier. You need to negotiate prices, but usually, it costs 1,500 THB for 90 minutes. The boat is large enough for at least 10 people. Bangkok has two airports, Suvarnabhumi and the much smaller Don Mueang Airport. Suvarnabhumi is the international airport of Bangkok, while Don Mueang flies mainly domestic routes and to some nearby countries. 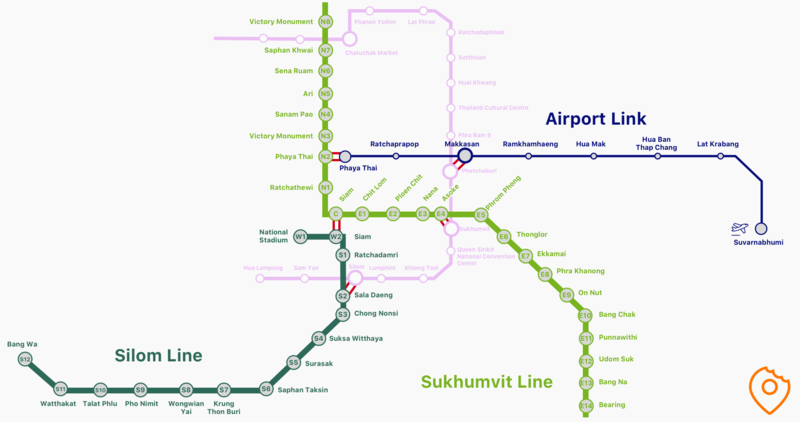 Suvarnabhumi has the Airport Link Connection, which means there’s a BTS connection between the airport and Phaya Thai BTS Station with six stops in total. How to get from Suvarnabhumi to Khao San Road? 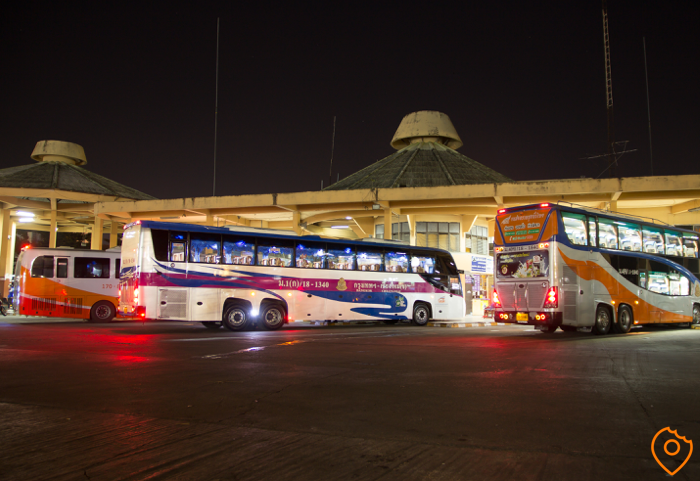 One of the most common ways to get from Suvarnabhumi to Khao San Road is by taking the Airport Link. This BTS Train will take you all the way to Phaya Thai and cost you 45 THB. From there, you can take a taxi to Khao San Road, which will cost you around 70 THB. The overall travel time is 50 minutes, depending on the traffic. You can also take the bus from Suvarnabhumi Airport to Khao San Road for 60 THB. You need to take Bus S1 at Exit Number 7. Keep in mind that bus rides can take up to two hours or more, depending on the traffic. A taxi ride from Suvarnabhumi to Khao San Road will cost you around 400 THB and this is the fastest way to get into the city if you choose to use the highway. If you’re traveling in a small group (up to four people), this is the most efficient and affordable way to get there. How to get from Khao San Road to Suvarnabhumi? The easiest way to get from Khao San Road to Suvarnabhumi is to take a taxi to Phaya Thai BTS Station and then take the Airport Link to Suvarnabhumi Airport. It will cost you around 70 THB for the taxi and 45 THB for the BTS ticket. 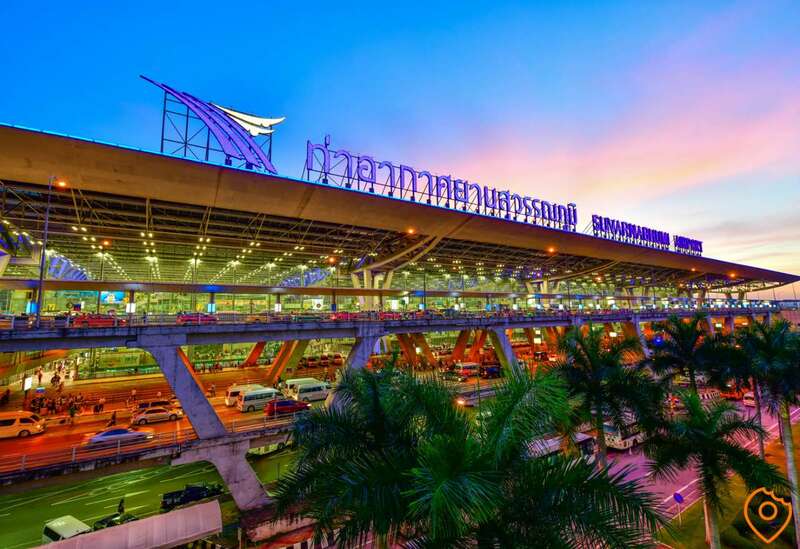 How to get from Suvarnabhumi Airport to Bangkok? It all depends on your destination, but the most convenient way is to take the Airport Link to Phaya Thai. This BTS Line has a total of six stops: Lat Krabang, Ban Thap Chang, Hua Mak, Ramkhamhaeng, Makkasan and Phaya Thai. The maximum duration is 26 minutes and costs 45 THB. If your final destination isn’t accessible from one of those stops, take a taxi from the first floor of Suvarnabhumi airport. How to get from Suvarnabhumi Airport to Sukhumvit? The best way to get from Suvarnabhumi Airport to Sukhumvit is to take the Airport Rail Link to Makkasan Station. From this station, you take a taxi heading south. Makkasan Station is located around two kilometers from Asok BTS Station and Sukhumvit Road. It will cost you around 140 THB when traveling alone. How to get from Don Mueang Airport to Bangkok? 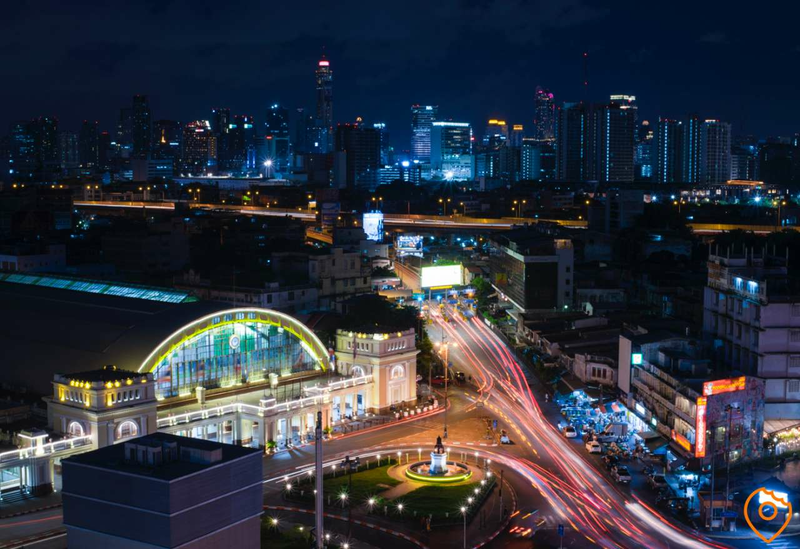 Although there are buses available, the most convenient way to get to the city center is by taking a taxi straight to your destination or to Mo Chit BTS Station. If you take the taxi to Mo Chit, you can take the BTS and MRT from there to your destination. As mentioned, it’s easier to get a taxi from the departure floor of Don Mueang rather than waiting in the queue at the arrival floor.